The climate change and global warming/ice age results in endosymbiotic actinidic archaeal growth in the human system and cholesterol catabolism resulting in endogenous digoxin synthesis. The increased endosymbiotic archaeal growth detected in autism and matrilineal communities with increased incidence of autism and neanderthalic origin leads to the conclusion that digoxin acts as neanderthalic hormone. The increased endosymbiotic archaeal growth and resultant endogenous digoxin synthesis in relation to climate change and global warming results in neanderthalisation of homo sapiens and human disease resulting in homo sapien extinction. Digoxin can inhibit reverse transcriptase activity and RNA editing resulting in suppression of endogenous retroviral growth. This produces inhibition of HERV expression and jumping gene phenomena producing in adynamicity of the human genome. HERV related jumping genes are crucial in synaptic diversity, HLA expression and immunomodulation as well as metabolic diversity. Digoxin produces alteration in sodium-hydrogen exchange producing an acidic pH and acts like a growth factor producing stem cell transformation of adult cells. Stem cells have a distinct metabolism with increased glycolysis and suppression of PDH and mitochondrial function. This can result in cancer and metabolic syndrome. The digoxin interference with RNA editing can lead to mutated RNA viruses and wide spread RNA viral epidemics. The digoxin interference with HERV expression and RNA editing and resultant inhibition of genomic, metabolic, neural and immune diversity produces autoimmune disease, cancer, metabolic syndrome, degenerations, schizophrenia and autism which are increasing at epidemic rates in human population. Actinidic archaeal secreted RNA viroids may play a crucial role in amyloid formation and pathogenesis of these disorders. The evolution and origin of homo sapiens and homo neanderthalis is on the basis of actinidic archaeal symbiosis and digoxin synthesis. Extreme climate change related increased actinidic archaeal symbiosis and digoxin synthesis results in homo neanderthalis. The homo sapien species results from inhibition of actinidic archaeal symbiosis and endogenous digoxin synthesis by normal global climate. Thus there are evolutionary swings between the two human species depending on extremes of climate and archaeal symbiosis. Endogenous digoxin can be considered as a Neanderthal hormone. There was increase in cytochrome F420 in CJD and other disease groups indicating increased archaeal growth. There was also an increase in free RNA indicating self replicating RNA viroids in CJD and other disease groups. The RNA viroid generation was catalysed by actinides. The RNA viroids can bind with proteins having prion like domains forming ribonucleoproteins. These ribonucleoproteins can give an abnormal conformation to the protein resulting in generation of abnormal prions. The abnormal prions can act as a template to convert normal proteins with normal configuration to abnormal conformation. This can result in amyloidogenesis. The abnormal configured proteins will resist lysosomal digestion and accumulate as amyloid producing disease states and extinction. Homo sapiens tend to have low levels of endosymbiotic actinidic archaea and low digoxin synthesis. Homo sapiens have low incidence of autoimmune disease, cancer, schizophrenia, autism and metabolic syndrome. The neanderthalisation of homo sapiens consequent to endosymbiotic actinidic archaeal growth and digoxin synthesis produces human pathology and extinction. Neanderthal genes have been described in the homo sapien population. The Neanderthal brain has a prominent cerebellar cortex and small prefrontal cortex. This results in defective vocalization, symbolic speech, impulsive behaviour, obsessive traits, intuition and extrasensory perception. The Neanderthal brain structure results in female dominance and matriarchal social patterns. It was considered plausible that Neanderthal genomics and metabolonomics could also contribute to androgynous behaviour. Autistic patients tend to have Neanderthal metabolonomics and phenotype. It has been demonstrated that Neanderthal phenotype is due to symbiosis by actinidic archaea using cholesterol as an energy substrate. The actinidic archaea catabolises cholesterol with ring A being oxidized to pyruvate which gets channeled to the GABA shunt pathway resulting in the formation of glycine and succinyl CoA. This results in porphyrin synthesis. The side chain oxidation results in generation of short chain fatty acids. Cholesterol is also converted to steroidogenic estrogens and testosterone. The increasing growth of actinidic archaea converts the body metabolites the cholesterol which is subsequently oxidized and depleted. Cholesterol is also converted by actinidic archaea to endogenous digoxin which helps to integrate the neuro-immuno-endocrine system. Digoxin produces sodium potassium ATPase inhibition and increased in intracellular calcium inducing nitric oxide synthase and heme oxygenase generating gasotransmitters nitric oxide and carbon monoxide important in smooth muscle contraction and autonomic function. 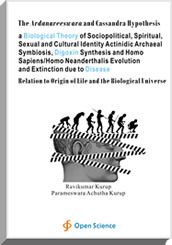 The book presents the biological basis of a neanderthalisation based Sociopolitical, Spiritual, Sexual and Cultural Identity.